The other day, discussions started about what we should have for Christmas dinner. Obviously, my kids have the big issues to deal with! There was much dissent around the main course, though there was unanimous approval of our traditional triple chocolate and raspberry pavlova for dessert. After moving to the farm, our Chrismas lunch usually consists of cold meats and salads followed by a selection of desserts. Hannah has put in a request for smoked salmon (she has her mothers taste), while I’m thinking about what salads to make. Last year I trotted out a pomegranate and halloumi salad I had found in a food magazine which was absolutely delicious. I love halloumi and commented that it was a shame we really only have it on special occasions, especially when the family loves it, and it is quick and easy to prepare. The next time CB was at the supermarket, he picked up a packet, saying that we should be having our favourite foods often, and not just for special occasions. Who am I to disagree?? Since then halloumi salad has made a regular appearance on our dinner table. When pomegranates went out of season, I made up my own salad based on the ingredients we had available, and it has been a hit. I often grill some chicken to go with the salad, but it can easily work as a main on its own too. The halloumi adds a meaty protein punch. We often toss some cucumber into the salad or some nuts over the top for added crunch. 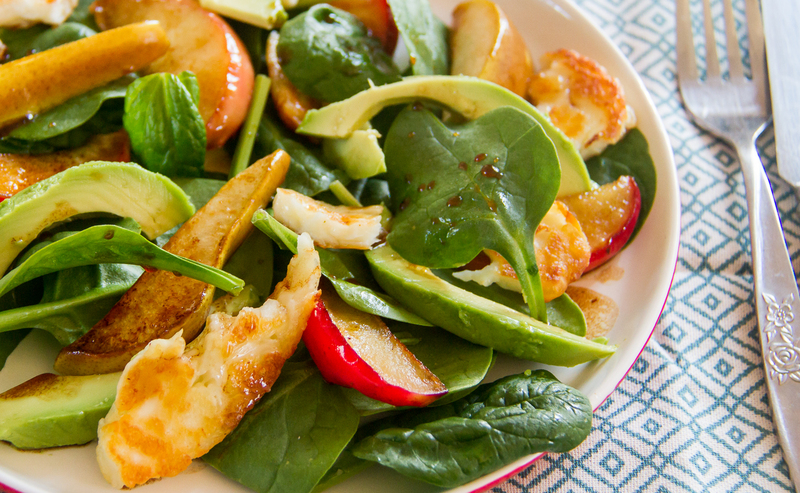 The variety of textures and the salty flavour of the halloumi contrasts beautifully with the sweetness of the apple and pear and the tanginess of the dressing. It’s one of those recipes that when the kids ask “whats for dinner” (which let’s face it, is asked a million times every day), always gets an enthusiastic response. Since moving back to the farmhouse, we have been keeping a stash of different cheeses in the fridge so that we always have what we need ready to go, and halloumi will last a little while on the fridge door, so it’s perfect to have on hand. Combine maple syrup, cider vinegar, molasses and olive oil in a small bowl and whisk to combine. Slice the halloumi into 08.cm thick slices. Heat a frypan over a high heat, add in some oil for frying, and fry the halloumi until golden on each side. While the halloumi is cooking, core the apples and pears and cut into thin wedges - I get between 12 and 16 slices per apple depending on the size. One the halloumi has cooked, remove from the pan, and set aside. Tear into smallish pieces. Heat some more oil in the frypan and cook the apple and pear until they are slightly caramelised on each side, but still crisp in the middle. Remove the apple and pear from the pan. 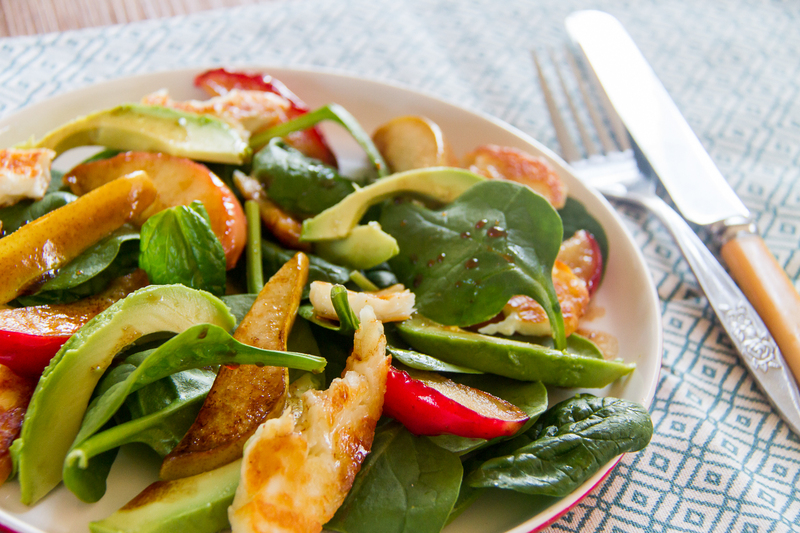 In a large serving bowl, place the baby spinach, avocado, apple, pear, and halloumi. Toss gently with the dressing. Sprinkle over the walnuts if desired. *If you don't have pomegranate molasses, add an extra teaspoon each of cider vinegar and maple syrup. I tend to serve this with some grilled chicken, but it would also be fine as a meal on its own. Are you a fan of Halloumi? Worked out what you’re having for Christmas dinner yet? Me neither.